At the risk of being called a curmudgeon, let me voice a dissenting opinion about Wonder, a "family drama" that veers too far into saccharine fantasy for its messages about tolerance and anti-bullying to sound a clear and genuine note. Oh, to be sure, Wonder's heart is in the right place. It wants to be a life-affirming, uplifting story about the triumph of the underdog but the movie ignores the full cruelty of upper elementary school life and sugarcoats the degree to which bullying can erode the day-to-day experience of a victim. Because Wonder wants to attract viewers of all ages and seeks to provide a "positive" experience, it glosses over the darker aspects that a story of this sort should address. In doing so, it at times feels dishonest and the Pollyanna-ish ending borders on cloying. That being said, I can understand where there is value in showing this film to younger children because the message, albeit sanitized, will resonate. A ten-year old watching Wonder will have a different experience than an adult. Bullied children may find some solace in observing the difficulties encountered by fifth grader Auggie (Jacob Tremblay) and how he pushes through them. And bullies may stop a moment to consider their actions. The movie, as brought to the screen by Stephen Chbosky (The Perks of Being a Wallflower), who co-wrote the adaptation of R.J. Palacio's novel, lacks sufficient dramatic heft to be considered the "full package." It's too determined to jerk tears, manipulate emotions, and tie all the loose ends of life into tidy package. Until the first day of fifth grade, Auggie has been home-schooled. The reason is obvious the first time we meet him: his appearance, the result of more than two-dozen operations, is a mass of scars and misshapen tissue that illustrate how far medical science has to go before claiming victory over facial deformities. Auggie knows the reactions he will provoke: stares, uncomfortable glances away, and more stares. He's prepared for these things and for the aversion and isolation that will accompany them but they hurt nonetheless. His educators, especially English teacher Mr. Browne (Daveed Diggs), are helpful, as is the headmaster of the private school, Mr. Tushman (Mandy Patinkin), but Auggie's first day isn't a good one. Things improve, however, when he makes his first friend: Jack Will (Noah Jupe), the first boy brave enough to risk being ostracized by bully Julian (Bryce Gheisar) for socializing with someone who looks like Darth Sidious. Wonder explores the stories of other characters. Perhaps the most interesting is Via (Izabela Vidovic), Auggie's older sister. Via's experience is that of the "normal" sibling who becomes an afterthought in a family where the parents' attention is focused on the special-needs child. Via doesn't openly resent that Auggie gets the lion's share of the attention available from her mother, Isabel (Julia Roberts), and father, Nate (Owen Wilson), but it's obvious that she craves more in the way of affection and validation. Her life goes into a tailspin when her best friend, Miranda (Danielle Rose Russell), inexplicably breaks contact with her. Fortunately, when one door closes another opens and Via finds solace in school theater and a new boyfriend, Justin (Nadji Jeter). Acting is one of Wonder's strong suits. Jacob Trembly, the child trapped with Oscar-winner Brie Larson in Room, presents Auggie as an inspirational figure when he could easily have been a tragic one. Izabela Vidovic, a TV regular, shows a range and maturity that argues in favor of her pursuing substantive roles in the future. The adult performers - Julia Roberts, Owen Wilson, and Many Patinkin - remain mostly in the background. This isn't their story and none attempts to leap forward and grab the spotlight. Roberts and Wilson portray parents who love their children but have divergent parenting styled and Patinkin plays the headmaster/principal every child wishes he/she could have. From its imagination-tinged opening to its Kumbaya ending, Wonder never forgets that its primary mission is to provide viewers with a non-threatening, warm-and-fuzzy experience. When conflict arises, as it must in all dramas, it's never too intense or wrenching. By soft-peddling the narrative, the film may be underestimating its core audience. A movie like A Monster Calls, which targets the same general age range (and was also based on a book), doesn't feel the need to carve out a "safe space" for its viewers. A Monster Calls is ultimately cathartic and uplifting but it acknowledges and confronts the unvarnished ugliness that lurks in dark corners. The result imparts a life-lesson while also delivering compelling drama. 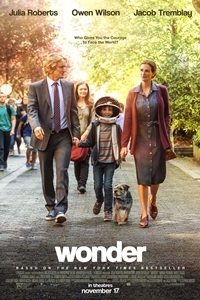 Wonder lacks the latter quality and it's reasonable to question how strong its commitment is to the former.